I just received my first conference talk acceptance, and after the excitement died down a bit the nerves kicked in. 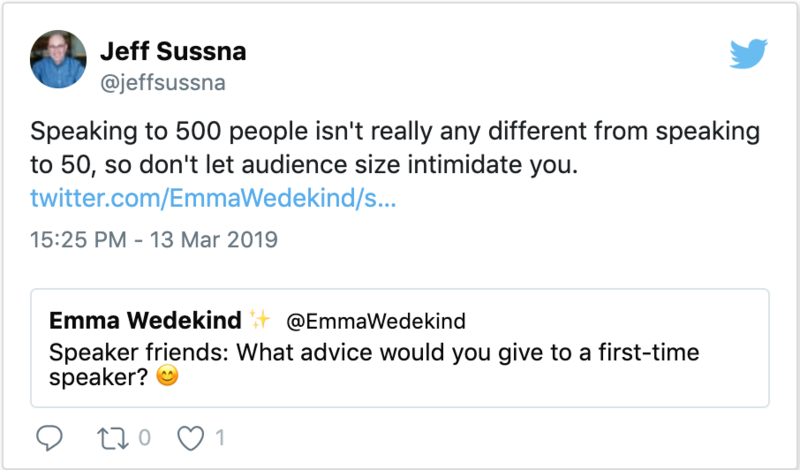 I've spoken at local meetups before, but the idea that I'll be standing in front of over 1,000 people delivering a talk kicked my anxiety into overdrive. 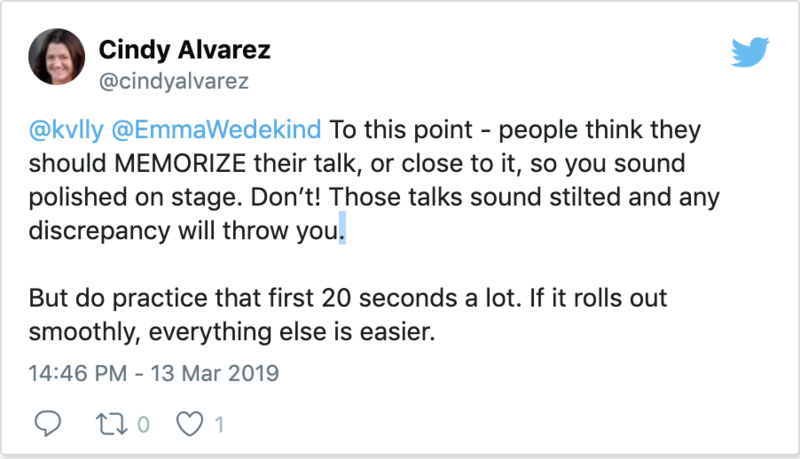 So, I turned to the community for their tips on giving a successful conference talk! Below, I've compiled some of my favorite responses from the community. A good conference talks starts with diligent preparation. Memorizing your talk is important, however you don't want to sound as if you're reading from a script. So it's important to memorize just the key points of your talk. This way, you'll sound prepared without sounding rehearsed. 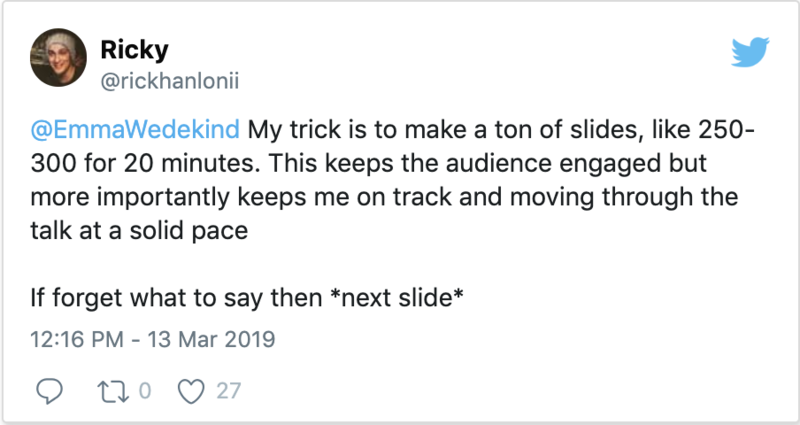 One of the quickest and easiest ways to keep your audience engaged is by having a lot of slides with a small amount of content on each. When you put too much content on a slide, the audience forgets to listen to you and instead focuses on reading the slide. Thus, having many slides not only keeps the audience engaged, but keeps the pace of your talk moving. Doing a practice run for a smaller audience is always a great idea. This way you can get all of your nerves out before the big day. This also gives you the chance to get feedback. What are the things that went well? What could be improved? Now is the time to ask. Circling back to memorizing your talk, one of the best ways to ensure your talk flows and has a thesis is by writing a script. What things do you really want to say during this talk? Scripts can also help you find the flaws or gaps within your content. And once you have your script, you can memorize a few key phrases or bullet points from it, but you don't necessarily need to have the whole thing down. Additionally, you can bring your script or outline up on stage with you as re-assurance. It's important not to fidget with the papers, however, as this can be extremely distracting. Starting with a story is a great hook to grab the attention of your audience. It will allow them to immerse themselves in the content matter. 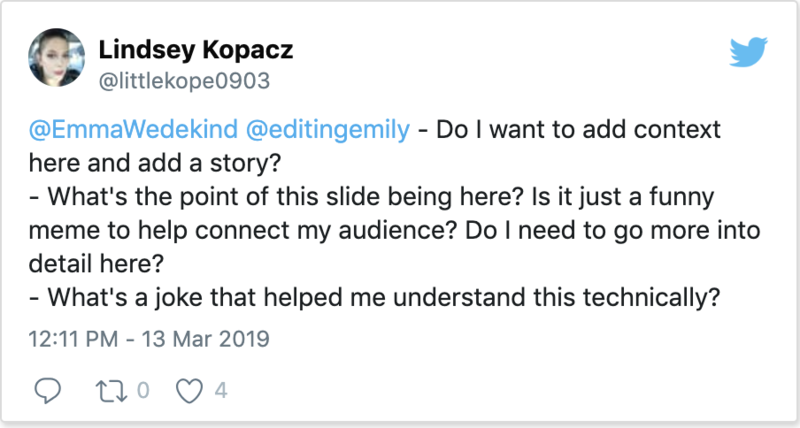 When you jump straight in to technical details, you lose the audience (except those already familiar with the subject matter). So take the time to find a relatable story. Forget to mention a small detail? No big deal! Your audience wasn't even aware that you missed it! Just keep going. Live coding is a great way to engage your audience, but can also quickly go south. Although I have seen some great live coding, it's extremely easy for something to go wrong and screw up your confidence. Including coding screen shots or GIFs is a great way to provide the security of working code while still giving the audience a look into your process. You might not think you'll need a bottle of water up on stage, but it's better to be safe than sorry. More often than not you'll get some nerves up there so it's best to have some water by your side. Not only can water help if you suffer from dry mouth, but it can also provide a short little break when you need to reset your mind. Wearing a comfortable outfit will be key to your success. If you aren't comfortable with what you're wearing, it will distract you from delivering your best talk. Pausing between sentences or phrases is important because it allows the audience to digest the last pieces of information. When you skip from one statement to the next without a break, it can be extremely hard for audience members to process the information. 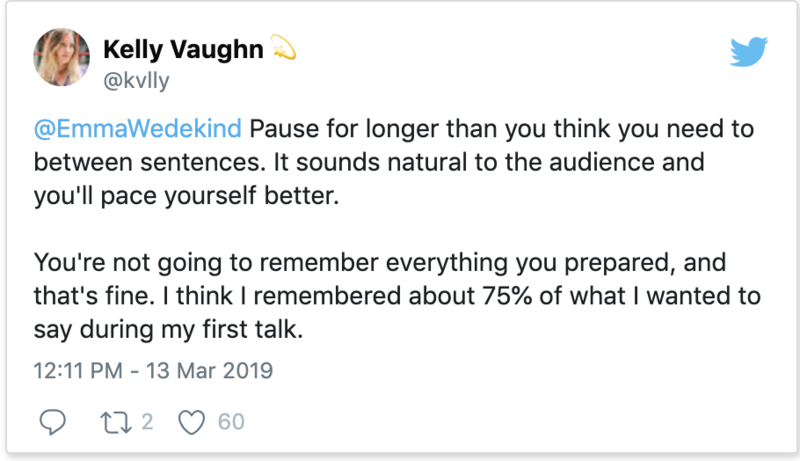 Sometimes your talk will finish much quicker than you anticipated, so it's totally fine to prepare some extra content which will provide additional benefit. Just don't rush through the main content to get to the auxiliary content. The time will fly much more quickly on stage than you anticipate. You are your greatest naysayer, so don't fret if you make a grammar mistake or stumble on your words a bit. The audience most likely won't notice all these little mistakes. By nature, you will always speak more quickly than you think you will. Thus, it's important to be mindful of how quickly you're speaking and take breaks in between key phrases. You can even find a friendly face or two in the audience to look to for reassurance. The audience is your biggest supporter. They want you to succeed! So don't focus if you stumble a little bit, keep going! They're rooting for you. No matter how seasoned you are as a speaker, you will most likely get nervous before a talk. Take that nervous energy and use it to your advantage! If you aren't enjoying your talk, neither will the audience. So it's important to showcase your enthusiasm for the subject matter. And never self-depreciate! You have nothing to apologize for. 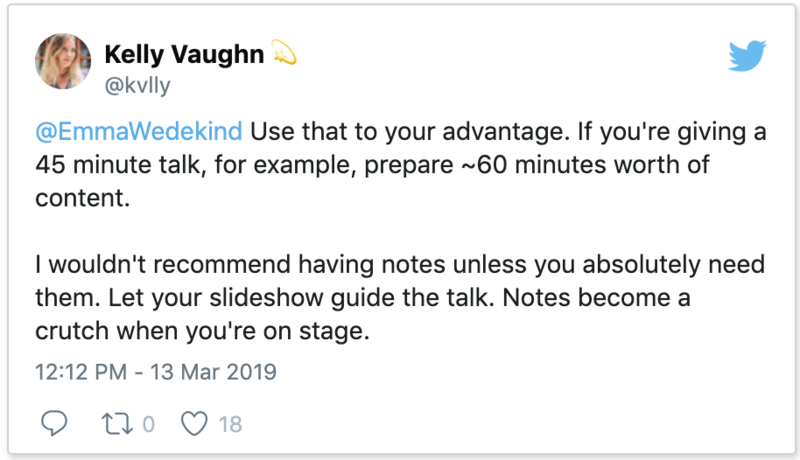 If you're looking for a good segue into your talk, praising the speaker before you is a great way to appear modest and perhaps shake some of the nerves you have walking on stage. If you take your audience on a learning journey with you, your message will be much more effective. Why are you passionate about this subject? What do you want audience members to walk away knowing? Never, under any circumstances, should you make jokes at the expense of another person or group of people. 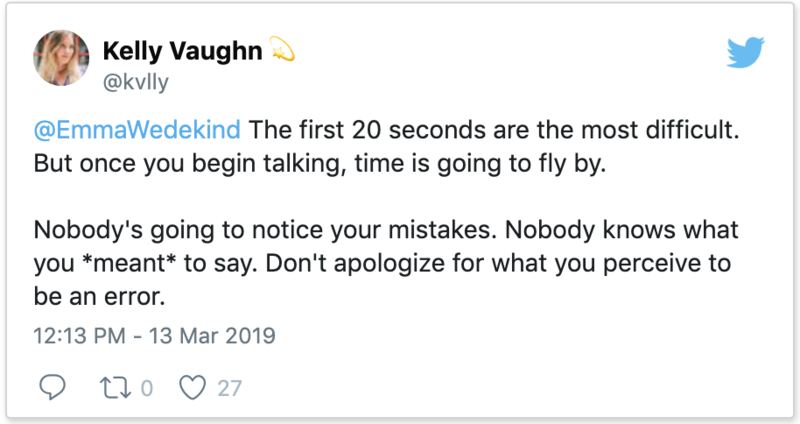 While jokes are one way to connect with your audience, shaming someone can quickly lead the audience to disrespect you and disengage from your content. 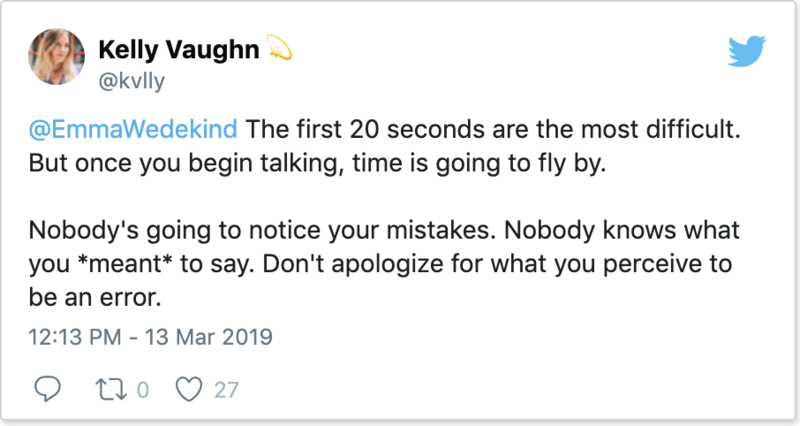 All it takes is one person to walk away from your talk having learned something to call it a success. You don't need to convince or impress an entire audience. If you make an impact on one person, that's all it takes. Your audience is the most important part of your talk. Remember that their time is valuable. They paid to be at this conference and hear you speak. So it's important to respect their time. Whether you're speaking to 50, or 500 people doesn't make that big of a difference. Just remember the tips above and you'll nail your first conference talk! 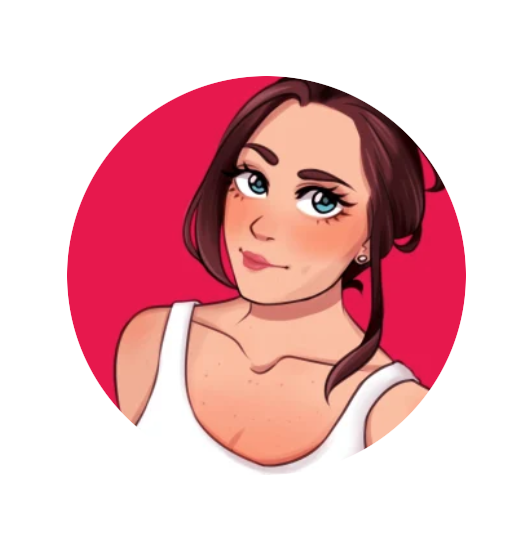 Special thanks to our guest blogger Emma Wedekind, a UX Engineer for her contribution to the Ronald James Blog this week.